You’re still here. On earth. What difference will your life make? 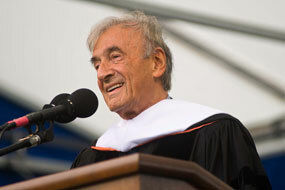 Elie Wiesel wrote something that changed me. He is a Holocaust survivor who saw things no one should ever have to see. Years after the War he published a 100-page book called Night in which he recounted his experience. He captured in words what no words can express. How indifferent have we become? Have we contributed to the slow fade of love, of education, of beauty, of life itself? This has been on my mind as Lent begins. Lent is the 40 day period leading up to Easter (excluding Sundays). It is a time of preparation, of pregnancy, of getting ready for the Power that will happen at ground zero of the Christian faith: Easter. Many people “give up” things. But why? To prove we can do it? Part of the reason is to take power away from things which have crept into our lives—things which further the cancer of indifference. Distractions. From who were were made to be. To our truer calling. I have things I’m “giving up.” (And this year I’ve decided to up the ante; to make it hurt a bit.) But the reason I’m doing so isn’t to prove my own mettle. I’m doing it in an attempt to purge the indifference that slyly creeps into our lives, often masquerading as something polite, something acceptable. Indifference is a master of disguise, entering the heart, planting roots in the service of ignorance, of ugliness, of hate, of doubt. I’m trying to ready myself for the Cross and Resurrection of the One who is Walking Difference. Waking Difference: Jesus. We cannot live through Easter, trust, and not be changed. It’s not about giving something up, it’s about getting something. Indifference is not an option. Sign-up for “Up,” my new 1-minute daily email devotional, by clicking here. when trust are broken…inorder to survive …indifference creeps in our lives….sooner we r a stone…but to others…inside we r no more alive….